Black, a popular correspondent on Comedy Central’s magazine programme The Daily Show with Jon Stewart, is a Mr Angry for the moment, especially on politics. He dishes out disdain left and right: “The only thing worse than a Republican or a Democrat is when they work together.” Refreshingly, he stays away from apathy by attacking tax-cuts and declining public services. Public services may not be an easy target for laughs, but his public lapped it up, filling the Brooks Atkinson Theater twice in one evening for the recording of Black’s HBO television special. Just round the corner on Broadway, at the long-established Carolines club, the energy levels were similarly high. 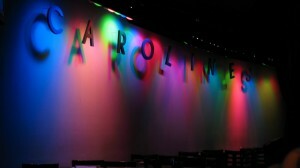 Carolines was born in Chelsea in 1981, and though not as old as the Comic Strip, the club is influential and a driving force of the new NY Comedy Festival taking place later this year. Headlining on the night I was there was Jim Norton. Though some people cringe at the mention of his name, Norton has his moments of creative irreverence and, like many comedians on the circuit, is not afraid to tackle issues of race and immigration. That night, Norton was exploding the “myth” that he had to honour his Irish roots, and made it clear that he was unlikely to be joining the St Patrick’s Day parade. Though clearly not a regular at Mass, Norton has a talent for confession, as his tales of Brazilian prostitutes reveal. Not to everyone’s taste, clearly, but the audience at Carolines responded warmly and was treated to a longer set than the standard 10 to 20 minutes. Television is still the promised land for many comics, who look to the holy trinity of showcase chat shows, hosted by David Letterman, Jay Leno and Conan O’Brien, as well as Last Call with Carson Daly and The Late, Late Show with Craig Kilborn. Then there is the Comedy Central channel, home to The Daily Show, (Dave) Chappelle’s Show and so on. Almost everyone who plays the clubs has a TV credit, but exposure and new talent do not always move in the same direction. One of the places to seek out good shows is Tinkle, another Lower East Side night, started by the comedian Todd Barry, which has less of a showcase feel about it. Talent-wise, one name bubbling away and rated by Singer, Birbiglia and me, after I saw him at Gotham Comedy Club, is Bill Burr. He is a redhead live wire who brings new energy and venom to well-trodden material. While I was in NY, I saw nothing that would have looked out of place on a London stage, and recently the wind blew the other way when the British and Irish Comedy Invasion arrived in town, with acts including the Anglo- Iranian comic Omid Djalili, Boothby Graffoe and Dylan Moran forming part of the first wave. The Irish comedian Tommy Tiernan follows later. Tiernan was also in NY when I was there, warming up for the Aspen Comedy Festival and pulling no punches with a good set incorporating material about Israel and the US ambition to become the rival superpower to God.